We used a different cheese (and more of it) and slightly different veggies (just what we happened to already have on hand). It was okay. I'd make it again, but I'd add way more seasoning and try the cheese and veggies Emeril recommends. It was pretty quick to make and would go great with a fruit salad or field greens salad. I like the idea of frittatas because it's similar to quiche but quicker and without a crust. 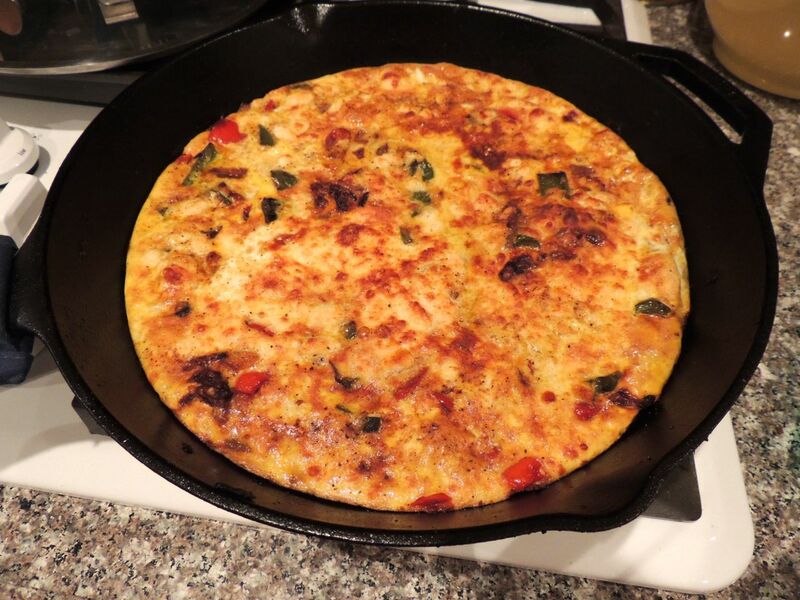 I've been making crustless quiche for years, so I might as well just make a frittata. Now that we have our new Lodge cast iron skillet, it makes for easy transfer from stovetop to oven as well. That was definitely our best purchase so far this summer. Cast iron is so versatile. I would definitely recommend buying a cast iron skillet if you don't already have one. It's great for the stove, the oven, the grill, and of course, it's great as a weapon (did you see the movie Tangled? ).